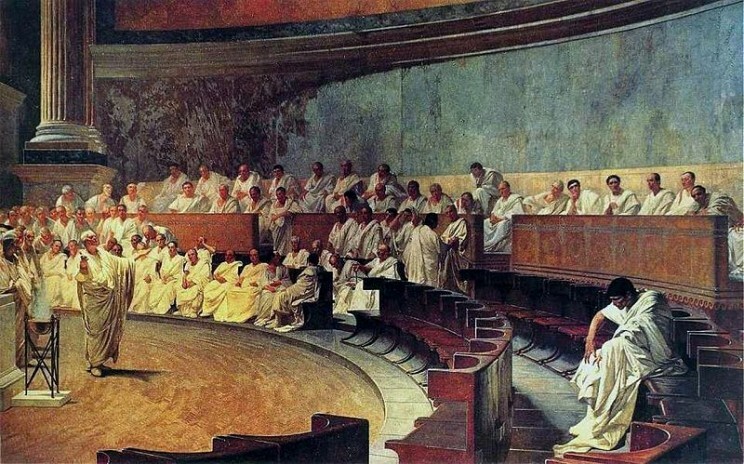 The Scottish referendum: where is Cicero? In a week’s time, the residents of Scotland (not the Scottish people: Scots resident south of the border are ineligible to vote) will decide whether or not to destroy the UK as currently constituted. The polls are on a knife edge; and Alex Salmond, the leader of the separatists, has a track record as a strong finisher. If he gets his way, the UK will lose 8% of its citizens and a third of its land mass; and Scotland, cut off, at least initially, from every international body (the UN Security Council, NATO, the EU) and every UK institution (the Bank of England, the pound sterling, the BBC, the security services), will face a bleak and uncertain future. Cicero denounces Catiline, from the Palazzo Madama. Public domain via Wikimedia Commons. Where is Cicero today when we need him? The debate on the future of Scotland, and hence of the UK, has been conducted in newspapers, in TV interviews and debates, and in social media. Anonymous internet trolls hurl abuse at celebrities who dare to express their affection for Britain. The Westminster Parliament stays silent. One MP, however, is free of the party whips, and has been touring Scotland delivering passionate, hard-hitting and unapologetically negative speeches in defence of the Union. This is George Galloway, and the speech he gave in Edinburgh on 24 June can be read and listened to here. 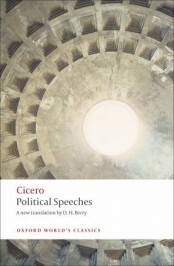 “Let it be inscribed on the forehead of every citizen what he thinks about his country”, Cicero told the senate. Next week, the future of the UK will be decided by a secret ballot. If Britain survives in a political and not merely in a geographical sense, part of the credit will be due to the Ciceronian eloquence of Mr Galloway. Ah yes, however we must remember that Cicero was a part of a vast, imperial machine who had no problem with conquering and governing nations against their will. I don’t think Gaul was given the option of independence after the Romans took over, regardless of whether they would have been better off or not. Alternatively, on the one side, Irving Welsh, on the other, Gordon Brown, enabler of war crimes and torture by voting for the illegal invasion of Iraq. But how absurd to invite people to judge a political project which is both supported and opposed by people right across any spectrum you care to name by hand-picking two individuals. Mere demagoguery, Mr. Berry.